There are certain things which tell a lot about a man, how he behaves under stress, how he empathizes with someone’s loss, and how he keeps his word. George W. Bush does a lot that doesn’t get mentioned by major media outlets, possibly because these do not fit their editorial preconceptions. He kept his promise to a wounded soldier who lost a leg in Afghanistan. 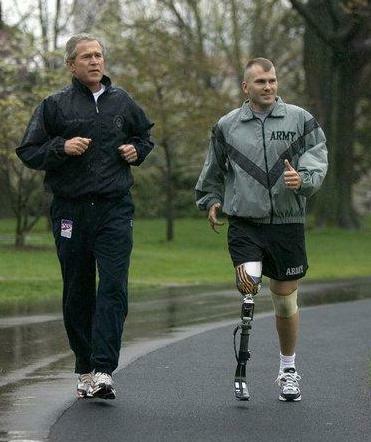 Fifteen months ago, when President Bush visited wounded souldiers in Walter Reed hospital, he told Mike McNaughton that when he could run a mile, that they would go on a run together. Earlier this Spring, Mike and the President jogged a mile at the White House.. In a moment largely unnoticed by the throngs of people in Lebanon, Ohio, waiting for autographs, George W. Bush stopped to comfort a teenager. I am proud that we have a President who is also a decent human being. I would not have his job for the world, as he is being second-guessed by almost every would-be leader in the country. In some ways, our country is like a giant log covered with ants drifting down a mighty river. Almost every damn ant on the log thinks he is steering. Mass media is busy creating their version of history, even as we watch, but fortunately for history, many of us are keeping an independent record of events. We may not always be right, but our agendas are a matter of public record. In the spirit of truth and openness, I owe other bloggers credit for pointing me to these heart-warming stories. Unfortunately, I lost their links while creating the post. You know who you are. Just remind me so I can give you credit. Aha! Memory returns! Denita TwoDragons of Who Tends the Fires lead me to Ashley Faulkner and Eric, the Mad Monk, of Who Tends the Fires lead me to the story about Sargeant Mike McNaughton with this. Thanks David for the smile. I needed to start my day with a smile and both you and Fred came through. You’re right…the major media would never print this…thanks for the balance. I’ve never liked Bush, didn’t vote for him and I won’t this time either. But the media does paint him like a cartoon, and the bloggers do have a 2-dimensional perspective of him. He IS more human than that. I don’t care for him at all as a leader of this country, but because I know there’s so much more to what’s going on than what is reported, I am totally disinterested in most of the emotional reactions by bloggers about Bush with regard to recent news. Thanks for the thoughts and pics. I agree with what you have written. It’s good that he sees first-hand the losses caused by the war. I’ve always wondered if he really understood the human cost. Denny, what the H-E-double-hockey-sticks are you trying to say…? That you don’t agree with these articles, or just that you don’t agree with Bush…? And just how different would your post have been if someone like Kerry had been the subject of these articles, hmmm?